Cloud-based CMMS (computerized maintenance management system) Limble CMMS is designed to cater to SMBs in different sectors. This feature-rich system comes with numerous capabilities that include preventative maintenance, asset management, and work order management. Limble CMMS allows users to assign, monitor and document each maintenance task as it happens. This helps them keep track of how much work is being done and how much they cost. The software makes it simple and fast for users to gather information and update existing data by taking pictures, uploading documents, following meter readings, note dates, and entering new work orders among others. Limble CMMS is now the choice for many companies to help manage their assets and facilities with its comprehensive feature set. It helps you organize and schedule maintenance and repairs for your assets, budget and monitor upkeep expenses, and ensure that all your assets and facilities are maintained regularly to further prolong their service lives to name some. With Limble CMMS, your workers are instantly made aware if and when repairs are needed to be done on your company’s assets and facilities. The software sends out alerts to your workers’ smart devices in real time so they can immediately respond and address the situation. Because all items are tracked and every expense is documented, you can easily explain asset life, justify maintenance, and set a reasonable budget for repairs and upkeep. Navigation is a breeze. The software doesn’t have a messy, cluttered interface. Information is well laid out and minor details can be easily found as tabs are easily identified by relevant icons. Limble CMMS is optimized to work on all platforms and devices, resulting in faster response and deployment. Information is instantly available, enabling you and your workers to act and respond intelligently to any issue or development. You can also test various scenarios without having to spend a single cent. Limble’s homepage as a “Live Test Drive” option that allows you to load a simulated environment so you can make a test drive and see how Limble works in action. What Problems Will Limble CMMS Solve? A. Setting up and effectively managing preventive maintenance work. Devin knows that doing preventive maintenance is far more cost-effective than waiting for something to break before starting with any maintenance work. However, he needs a tool that will let him quickly schedule preventive maintenance work, track who is doing what and how much is that costing him, easily switch work priority and due dates, etc. That is why Limble lets you automate this process as much as possible with easy-to-use calendar, instant push, and email notifications, and quick due date and work priority switching. On top of that, his whole team can use Limble on all mobile devices which lets them maximize their productivity. B. Customized asset management that lets you track only things you want to track. Matt wants to have a quick and easy overview of all of his critical assets so he doesn’t waste his time looking at 5 different files to extrapolate all of the information he needs. Limble allows him to create and customize only fields (like Make, Model, Manual, Pictures, Meter readings…) he wants to track and overview them in one place through centralized asset card. Additionally, he wants to have a quick access to all work orders, PMs, and work requests for faster diagnostic and an actionable audit trail – and he can do all that by looking at Limble’s detailed maintenance logs. C. Complete control over parts and inventory. Mark needs to ensure that the whole maintenance team has every tool/part ready for any preventive and/or unscheduled work. Usually, he would constantly need to track if there are enough spare parts through tiresome inventory checks. As people make mistakes, it would even happen that a machine broke down and there are no spare parts available, bringing huge losses to his firm. Thanks to Limble, all of that inventory is now tracked automatically. The software tracks whenever a part is used and sends notifications when a part’s quantity falls below a set threshold. With parts logs, he can see where the part is being used and by who. Real-time reports help him forecast and optimize stock levels, as well as eliminate unused parts. 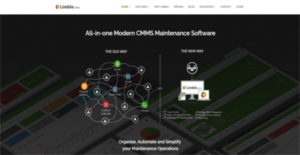 It is essential to realize that almost no service in the Maintenance Management Software - CMMS category is an ideal solution that can meet all the needs of all business types, sizes and industries. It may be a good idea to read a few Limble CMMS reviews first as some solutions can dominate only in a very narrow group of applications or be prepared with a very specific type of industry in mind. Others can function with a goal of being easy and intuitive and therefore lack advanced functionalities welcomed by more experienced users. There are also apps that support a large group of customers and give you a rich feature set, but this in most cases comes at a higher price of such a service. Ensure you're aware of your needs so that you select a service that provides specifically the features you search for. How Much Does Limble CMMS Cost? We realize that when you make a decision to buy Maintenance Management Software - CMMS it’s important not only to see how experts evaluate it in their reviews, but also to find out if the real people and companies that buy it are actually satisfied with the product. That’s why we’ve created our behavior-based Customer Satisfaction Algorithm™ that gathers customer reviews, comments and Limble CMMS reviews across a wide range of social media sites. The data is then presented in an easy to digest form showing how many people had positive and negative experience with Limble CMMS. With that information at hand you should be equipped to make an informed buying decision that you won’t regret. What are Limble CMMS pricing details? What integrations are available for Limble CMMS? If you need more information about Limble CMMS or you simply have a question let us know what you need and we’ll forward your request directly to the vendor.